Ask a Toxicologist: Is it safe to microwave food in plastic containers? When was the last time you microwaved food in a plastic container? At some point in my life, I switched many of my plastic food storage containers to glass containers. Someone told me, perhaps my mom, that microwaving food in those plastic containers could cause bad chemicals from the plastic to leach into my food. Does that really happen and what are the health consequences? With the splendors of PubMed at my fingertips and some free time, I decided to find out. 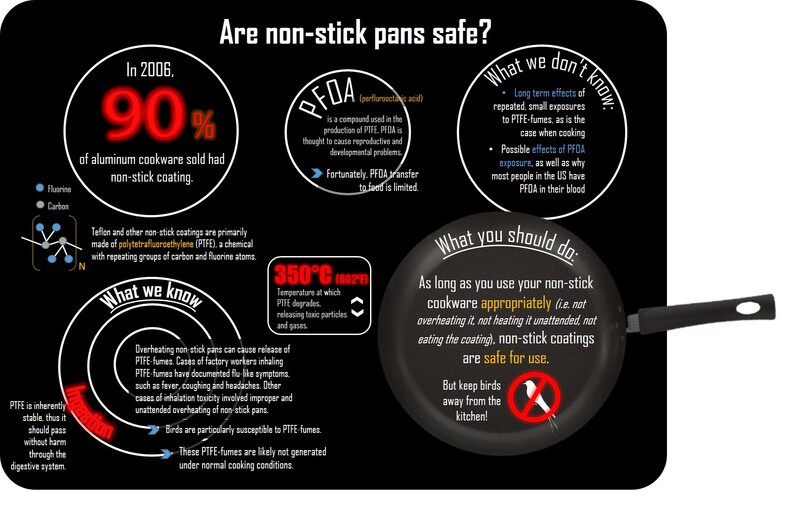 As in my previous post on Teflon, I’ll follow the basic steps of toxicity assessment to organize my findings. Hazard Identification and Characterization: What is the culprit? What does it do? Bisphenol A, or BPA, is commonly used in the production of polycarbonate plastics; it is one of the most commonly produced chemicals in the world. Plastics made with BPA have been used in food packaging products since the 1960s and are used almost everywhere. In fact, the 2003-2004 National Health and Nutrition Examination Survey found detectable levels of BPA in 93% of Americans aged six years or older. Studies have found that BPA interacts with estrogen receptors, as well as other receptors in the body, potentially mimicking actions of the estrogen hormone. Estrogen is a key hormone involved in the development of reproductive organs (particularly in women), bone growth, cardiovascular health, and proper human development from embryos to adolescents. Because estrogen is a key endocrine signaling hormone involved in proper function of the body, disrupting its balance through exposures to chemicals that mimic the effects of estrogen could have negative health effects. Many of these adverse effects could even happen at low doses. Exposures to endocrine-disrupting chemicals are of particular concern for babies and young children, who are more sensitive during their period of human development. 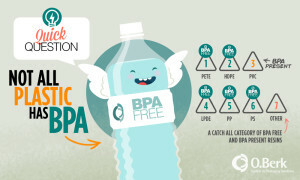 Since the heightened public awareness of BPA in baby bottles during the early 2000s, companies have produced BPA-free plastic products and can linings. 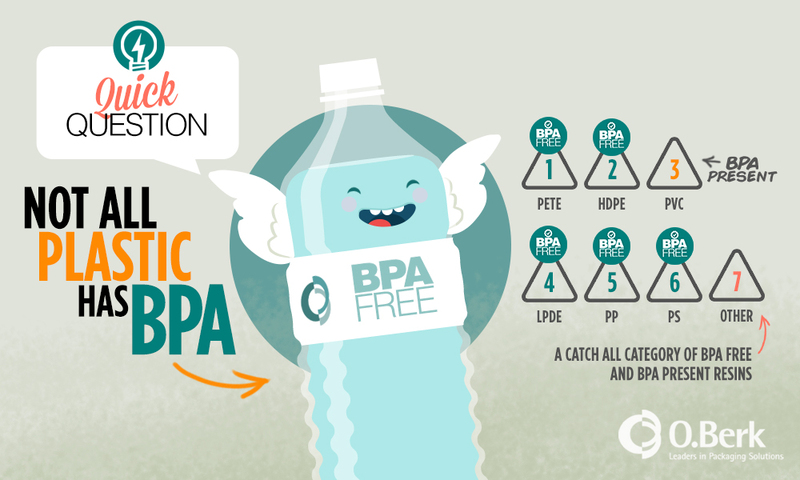 However, the BPA in these products has most likely been replaced with other chemicals, such as Bisphenol S and F (BPS and BPAF), which may be just as hormonally-active and endocrine-disrupting as BPA! Thus, the food containers labeled BPA-free may still be a source of endocrine-disrupting chemicals. There are many other chemicals that go into the process of creating plastics that could be of concern. For our purposes today, I will limit our discussion to BPA and BPA-substitutes. 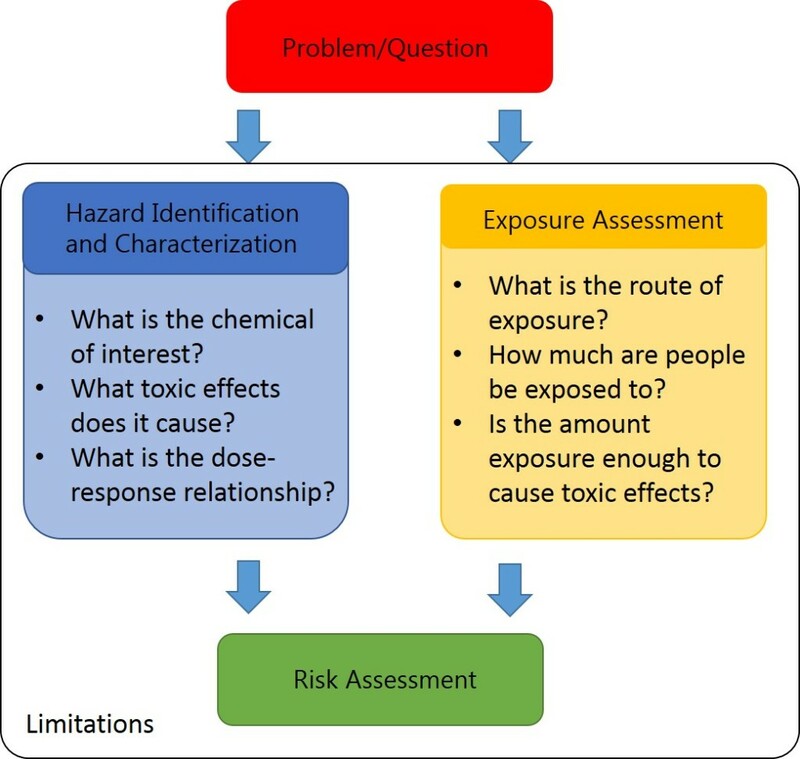 Exposure Assessment: How, how much, how often? In our situation here, exposure to BPA and/or BPA-substitutes would occur through ingestion of food or water contaminated with chemicals released after microwaving plastic storage containers. So do chemicals leach from plastics after microwaving? If so, is there enough chemical leached to cause a response from the estrogen receptor? The amount of BPA or related chemicals released by the plastic depends on the temperature of the plastic, the acidity/basicity of the container’s contents, and physical stresses and damage to plastic. Based on their assessment of the literature in 2015, the European Food Safety Authority (EFSA) established that the safe BPA intake limit is 4 ug/kg of body weight/day. The EFSA concluded that current dietary exposure to BPA is 4-15 times less than the safe limit. The US Food and Drug Administration does not list a specific intake limit but does state that, based on its most recent safety assessment, BPA is safe at the current levels in foods. Other studies have reported that microwaving baby bottles or water bottles increased the amount of BPA released, but these levels did not result in release of BPA at levels that exceed the EFSA standard. Regarding BPA-substitutes, Dr. George Bittner and his team at the University of Texas in Austin have conducted a comprehensive study on BPA-free products. They stressed the plastic under various conditions: exposing to UV light, microwaving, and autoclaving (extreme heating and steaming similar to what happens in a dishwasher). 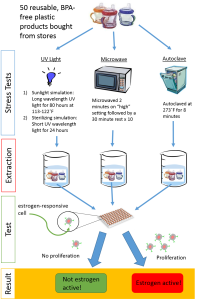 After collecting the chemicals released from the stressed plastics, they tested if the extracted chemicals interacted with the estrogen receptor, by exposing estrogen-responsive cells that would proliferate upon activation of the estrogen receptor. If the cells proliferated, the product was concluded to leach chemicals with estrogen activity (EA). The researchers found that many BPA-free products leached chemicals that were estrogen active. Thirty-one out of 40 products leached EA chemicals after exposure to UV light, 4 out of 16 after microwaving, and 5 out of 24 after autoclaving. What’s exciting is that they found plastic products that did not leach estrogen-active chemicals, even after exposure to various stresses. Thus, plastics can be made in a way that eliminates our exposure to estrogen-active chemicals! 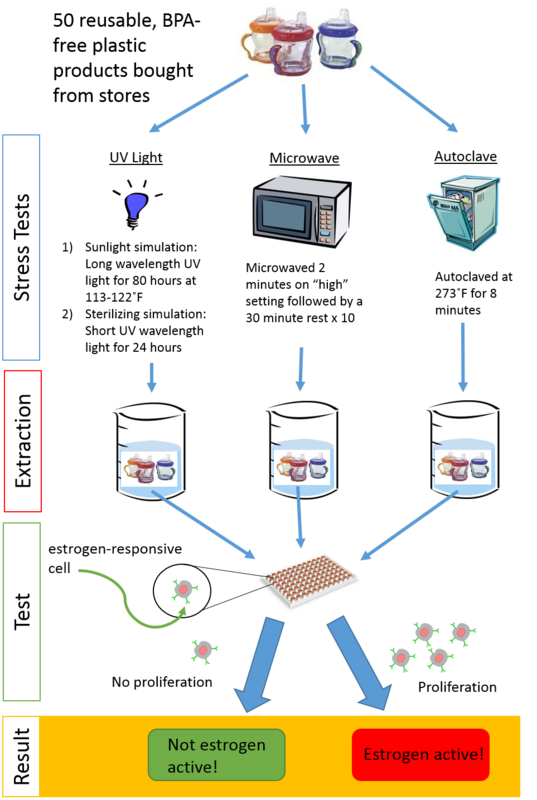 A positive reading on the cell-based estrogen activity test used by Bittner and his team is not necessarily indicative of what will happen when the body is exposed to the same compound. The body is generally pretty good at breaking down and getting rid of foreign chemicals; therefore, if a compound was tested in animals, it may not show as much estrogen activity as predicted by the cell-based test. The study published by Bittner et al. did not identify or quantify the amount of chemicals extracted from the plastics. Not knowing the identities of the leached chemicals is not a necessarily a concern because the chemicals, regardless of what they were, caused estrogen activity. What is a concern is that we do not know the concentrations of the chemicals causing these effects. While the study does simulate real-life use of plastics to some extent, we cannot be sure that the concentrations being assessed in this study are relevant to what we would be exposed to at home. Probably for the general adult, but avoid doing so if possible. It’s always better to reduce exposure if you can! Microwaving BPA containing plastics resulted in release of some BPA, though not exceeding the established safe level. Studies show that exposure to low doses of BPA could have effects on human health, particularly during early stages in life. 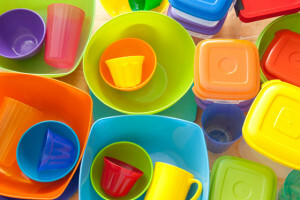 Some BPA-free plastics do release chemicals with estrogen activity after microwaving. The health effects of exposure to many BPA-substitutes and other chemicals used in plastic production may be similar to that of BPA. The scientific research on both BPA-substitutes and BPA is ongoing, which will help clarify what exposure level is indeed safe.